As if I wasn’t bad enough with providing timely race reports…Seems like in the off-season things are just slipping a little. After the first weekend of USGP racing, I took 2 weeks off the bike. This coincided perfectly with a trip back east to my brother’s wedding, and it was nice to not worry about traveling with a bike or getting a training ride in. The wedding was beautiful, and it was great to visit with family members I don’t get to see enough of during the race season. A week passed pretty quickly and before I knew it I was headed back to Colorado. When I got home the weather had turned cold. I busied myself with winterizing our house: turning on the heat, unhooking the hoses and irrigation, picking all the green tomatoes before the frost got them, etc. Fortunately it was only a 2 day cold snap, and soon the temperatures were back to the high 60s, and the sun was out. The beautiful fall weather I love had returned, and I was able to get a couple days in on the bike before the USGP weekend. I arrived at the venue a couple of hours before my race start, and headed out for a quick pre-ride. The course was muddy and slick in places, but it had stopped raining, and I knew it would dry out fast. I headed to the LUNA tent, made an espresso and sat on the trainer for awhile to warm-up. 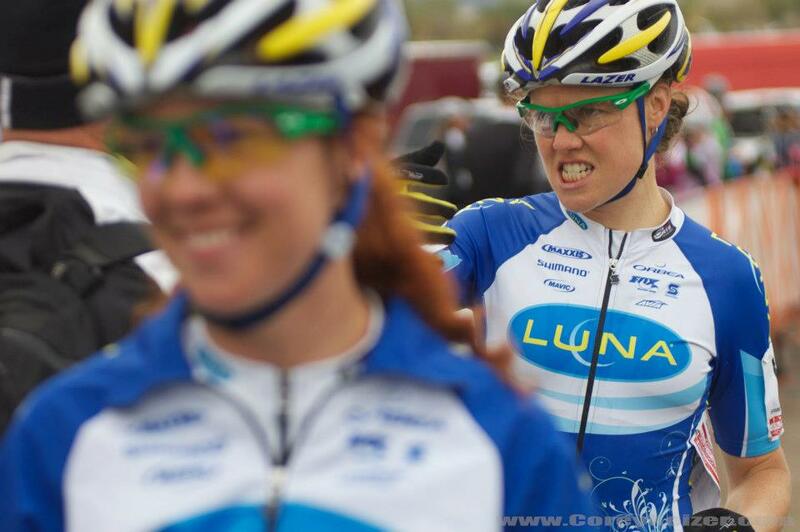 Doing some smack-talking before the race. Since the UCI points aren’t updated until after the first World Cup, I was still starting on the second row, so I lined up behind Teal and told her “Don’t screw this up! No pressure…”. Luckily, she took my sage advice. We both had great starts and were in the top 5 through the first few corners. The course was still a little bit greasy in spots, but it was drying out fast and traction was good. About halfway through the lap Katie went to the front, and I went with her- I was determined to stay on her wheel as long as possible. 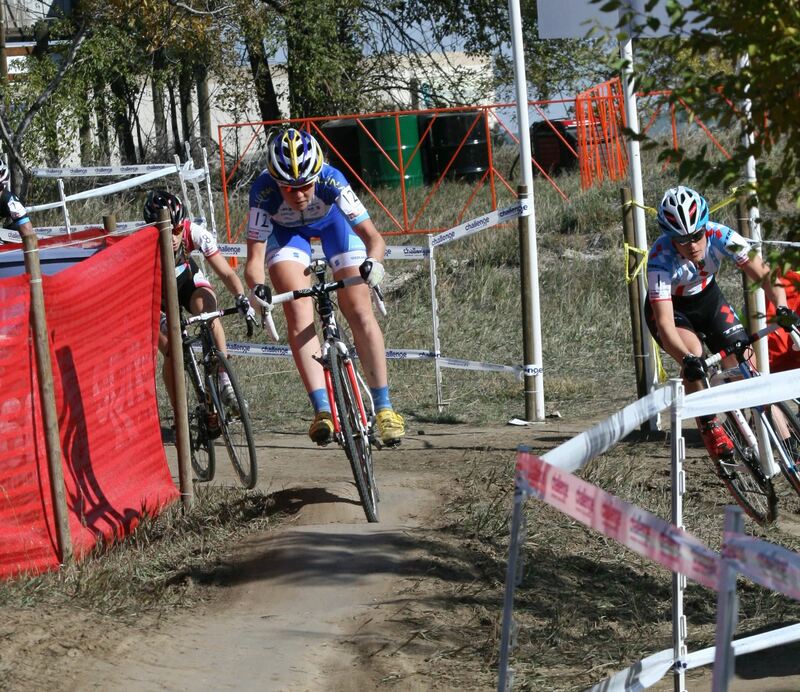 She was keeping the pace high and riding fast and smooth in the corners. I hung in there for a bout a lap and a half, but race pace was feeling a little painful, and I was definitely not as comfortable railing around corners on my ‘cross bike. A gap opened up, and I had to just settle for riding my own pace. The rest of the rest was pretty boring- Katie won, I finished second and Teal got third (which was awesome, not boring). John’s making sure I’m not slacking. Thanks, buddy. The next day the course was completely dry, hard-packed and fast. I had an OK start, but the faster conditions allowed a bigger group to stay together at the start. I was at the back of this big group, and I didn’t like it. As we came through the start-finish after one lap, I went to the front and set a good hard tempo in the hopes of paring the group down. After pushing the pace for a full lap, I had indeed shed a few riders, and as we came through the start-finish Katie launched a huge attack. No one went with her, and I was already tapped. Turns out I am a great lead-out rider…you’re welcome, Katie. I didn’t have the legs to chase her down, so I settled in to my own pace. 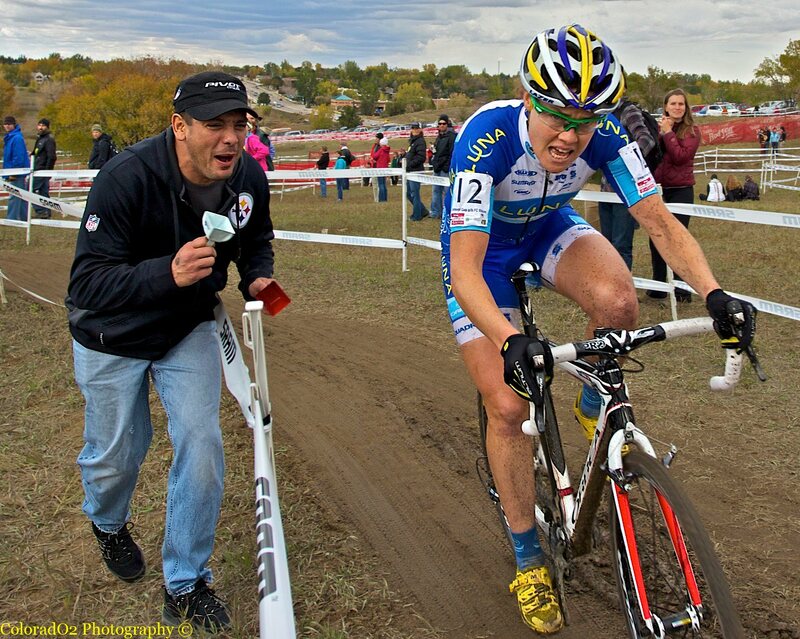 Julie was right on my wheel, and I pushed hard in a few sections to see where I was stronger. We were pretty evenly matched, and I was a little nervous about letting it come down to a sprint- I’d already screwed up tactically ONCE in the race. I decided to sit on Julie’s wheel for a lap, see how she was riding and then attack early in the last lap (you know, to give myself more options in case THAT attack failed). 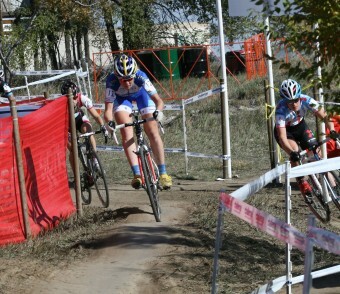 I was able to rest a little bit while sitting behind Julie, and I put in a big attack early in the last lap. She closed it down, but I kept punching it out of every corner, and eventually I got the gap I was looking for. I came through for 2nd, with Julie a few seconds behind me in 3rd. The start of my lead-out for Katie’s attack. I’m smart! I was satisfied with my weekend- I obviously would have liked to be challenging for the win, but that wasn’t very realistic given my recent time-off. Fort Collins fans were out in force- thanks to everyone who showed up and cheered/heckled or rang a bell- we racers really appreciate it!